As home theater design and technology changes, so do off-air antennas. An off-air antenna receives over-the-air broadcasts over a long range. If your home was built in the 90s or before, there’s a good chance that you have an old antenna on your rooftop. However, modern off-air antennas can be a great way to save money and avoid paying monthly outside or inside, depending on the model. 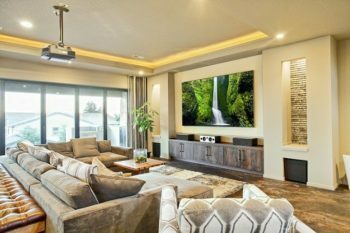 At Flat Panel Pros, we’re not just a home theater store, we install off air antennas Vancouver, Washington homeowners need to watch cable channels. With more homeowners switching off of pay-TV providers for streaming online services, cable TV channels are making a comeback in a major way. Believe it or not–but the need for an off-air antenna has steadily increased over the last three years! Instead of using a pay-TV provider, people who set up digital TV antennas avoid high monthly costs. Having free digital TV channels on top of subscription streaming services saves you money over time. The best antennas for your TV all depend on your proximity to over-the-air stations. In Vancouver, Washington, you have at least 54 stations to choose from. At Flat Panel Pros, we also remove or replace outdoor TV antennas. Whether you’re looking to replace your antenna with a newer model, or completely remove your old antenna for a more modern look on your home, call us today. Don’t Disassemble You TV Antenna On Your Own! Call the Flat Panel Pros to Install Your Antennas and Bring Your Home Entertainment System to Life! Our installation team maintains a high standard of customer communications. We take the time to listen to your needs, inspect the areas where equipment will be installed, and go over ideas and suggestions for an exceptional home theater system. Our home theater installations are all about simplicity of design, flawless audio installations, careful flat screen installation, and more. We make sure your equipment is easy to use, and we are happy to answer any questions you have about your new home entertainment system.